"This wise woman--without a doubt, is a teacher to many in the community. Your presence and teachings will live through me always, and beyond this life." 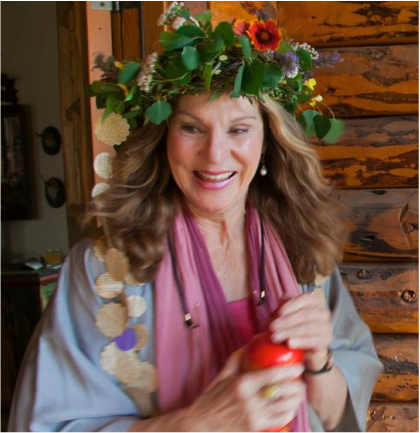 -Sarah Stearns, Film-maker, visionary artist, Earth Wisdom Mystery School participant. ~At this momentous time in the cycle of the seasons and Earth Celebrations of the Year, the influence of light in our days reminds us of the need to release old pains, complaints and shadow qualities. Just as we are purging, we are also beckoning the Opening of an amazing portal into profound exponential awareness. For many of us, this has been a year of loss, expansion, challenges and transformative risks. We are being called to witness the absolute need for personal and global community change. Have you felt that personal pang that reminds us: “Do I know what I am, what I am here for, what I am directed to be-come and share in my lifetime?” In the last few years so many of my clients and Mystery School interns have walked through the fire of loss of expectations inculcated from childhood, loss of actual homes, jobs, relationships, connection with children, friends and colleagues—a general loss of a sense of Self. Only when we completely and humbly release our carved-in-stone expectations can true Faith have room to come in and fill our lives. This is the Shamanic experience of spiritual death and ritual re-emergence. This is the Spontaneous Vision Quest. And, this can be the beginning of your truly transformed BE-ing, the expansion of your Integrative Medicine Healing gifts and the expression of these gifts as service in the world. Please call on me for spirited and spiritual support, experienced elder advice and deep mercy and understanding of the challenges and promises of your current Life-Stage Change. Let me assist you in expanding your passion, peace and purpose. Let me guide you as you develop your Life Practice. Let us discover your true intuitive healing and creative magic path. You are loved, you are worthy, you have infinite courage informing your Path in LIFE.